For every special (and not-so-special) occasion, there are thousands of adult beverages waiting to help you celebrate. This is great for consumers, but for brands, the battle for cooler and refrigerator space has never been more intense. The alcoholic seltzer category is no different, and Mighty Swell was struggling to stand apart. They needed a positioning: a rebirth that would differentiate their product, invigorate their sales team and awaken consumers. During the competitive analysis phase of our brand positioning exercise, we identified something pretty significant about Mighty Swell’s rivals—watered-down sameness. Their packaging and promotions are primarily white and they tout things like low calories and water purity. 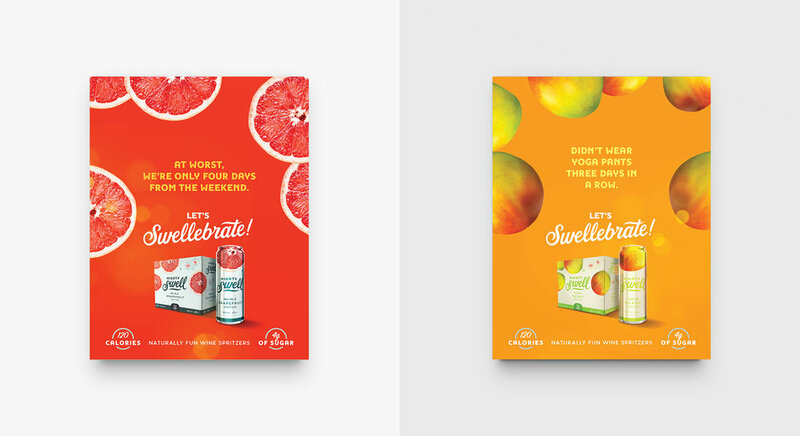 To set Mighty Swell apart, we invented a word that embodies the playful flavors, vibrant colors and carefree nature the company stands for: “Swellebrate!” That single term sparked an internal rallying cry, a campaign to unveil their new fruit-forward packaging and a definition for the feeling you get when you pop open a can of Mighty Swell. Door Number 3 changed the trajectory of our company. We originally came to them for a new campaign. What we got was the perfect mix of creative storytelling and brand positioning. The brand mantra that they created for Mighty Swell has completely reenergized our company. Already Like what you see? Want to see more cpg work?